THE murder of a man whose skull was found near Tin Can Bay is being investigated by Gold Coast detectives following his identification as missing Gold Coast father Shaun Barker. It is one of two suspicious deaths being investigated in the Gympie region, and police said they were "keeping an open mind" about any connections between the two. The first, the unidentified Cedar Pocket torso, remains a mystery, but the second, the Toolara State Forest skull and bones,has had a breakthrough, with the victim formally identified as "loner' and father-of-one, Shaun Matthew Barker, missing since December, 2013. Police said they were treating Mr Barker's death as a homicide, confirming that two bodies found just kilometres apart both likely met with foul play. 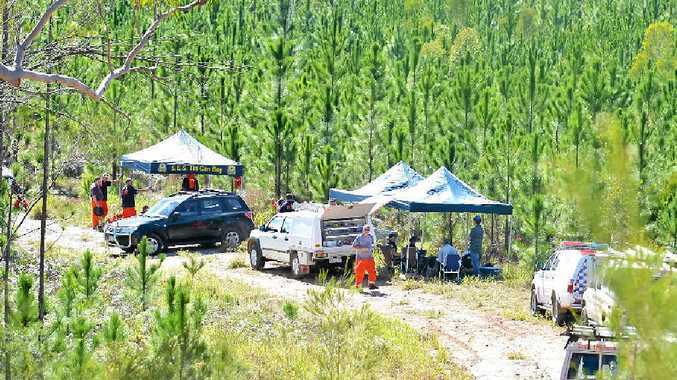 Wide Bay Burnett Detective Inspector Bruce McNab assured Gympie region residents that while it was "uncommon to find human remains, two lots, in one region" there was no risk. DNA tests established the torso and skull did not belong to the same person and Det Insp McNab said it appeared the deaths were not related. While similarities between the remains - each the partial remains of males found abandoned in rural locations - beg the question of a link between their deaths, Gold Coast Detective Acting Superintendent Brian Swan, who is now handling the case, said it was quite possible the skull, unlike the torso, had been pulled from its body by wild animals. In a press conference at the Surfers Paradise, Det Acting Supt Swan said having "previous experience in these sorts of matters" wild dogs and pigs could well move remains around. He did not rule out the presence of a gun shot but did say damage to the skull could have been caused by animals. He said he was yet to explain how Mr Barker ended up on the Cooloola Coast, some three hours from his home and who, if anyone, left him in Toolara State Forest. One aspect of the mystery police are calling for assistance with is the location of Mr Barker's missing blue Kia Rio car, with registration plates 518 TBV. "At this point in time we have no leads on his vehicle," Det Acting Supt Swan said. He said police were investigating Mr Barker's past and associates, and said he was known as a "loner". He said while he could not comment on Mr Barker's criminal history, "we've got no connection with CMGs (criminal motorcycle gangs) at this point in time". He could also offer no link between Mr Barker and the Gympie region. He said Gold Coast detectives were still "keeping an open mind" about a possible connection between Mr Barker's death and the discovery of the torso and they would continue working with Wide Bay Burnett police. Det Insp McNab said there had "definitely not" been any requests from Gold Coast police or Mr Barker's family for another search of Toolara Forest but local detectives would continue to "chip away" at identifying the Cedar Pocket torso. He said police had permission from the Queensland Coroners Court to question pharmacies about customers who purchased quinine, and had obtained a list of names. They were now in the process of obtaining Federal Government information about patients who had also been prescribed other drugs found in the torso. Anyone with information should contact Gympie police or CrimeStoppers by calling 1800 333 000, available 24 hours a day.